Getting a flashback from less than 50% previous months, this month the bitcoin has unite 50% of its lost value but again bitcoin has a pullback from $9,767 to $9,100. 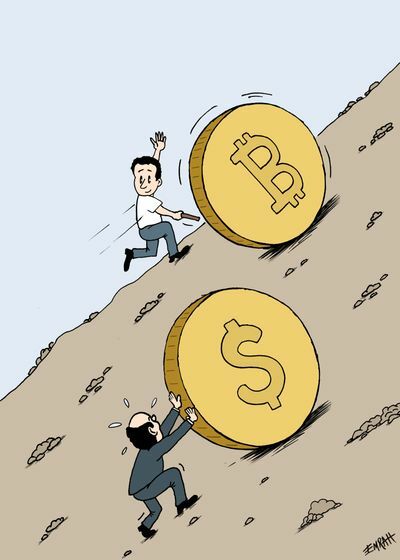 Bitcoin rose to $9,767 since March 12 but again declined back to $8,814. Initial bullish and then again initial bearish in trading price of bitcoin had disturbed the market again. The decline is of 6.2%. This graph indicates the bearish engulfing and it is showing the previous 4-hour high and low also suggests bullish exhaustion. Here it is showing relative strength index (RSI) and showing the trend line of BTC whose current performance is $8,654. MAs are sloping upwards and aligned one below in favor of the bulls which is likely to go below $8,650.Only a close (as per UTC) below the ascending 10-day MA would signal short-term bullish invalidation. The above chart is indicating the daily rising and declining trading price and also the short-term bullish setup. The long-run trend line of 20th April is showing the present trading scenario. So, the long-run outlook as indicated by a number of aspects remains bullish. Bitcoin remains on the hunt for a bullish break above the $10,000 mark. There is a risk of a pullback to $8,650-$8,600 in the short-term. Only a close below is MA at $8,671 would abort the short-term bullish view.